This pattern makes (two copies of) a traffic light by creating each blinker separately. I can usually resist this kind of thing, but today I noticed that a kickback reaction into one of Guam's snazzy new 2G-to-G converters produces a fairly clean output glider on the same relative lane, so you get a chain reaction. So now I wish there was a use for a really really slow one-time kickback reaction that doesn't happen until you've fed in 2^N gliders... but in the meantime, it's a nice Useless Discovery. I manually placed seeds for a flashy explosion rather than a minimal cleanup, so I'm sure someone can find a solution with the Seeds of Destruction Game using about three blocks. Ah -- I mean, I'm sure nobody will be able to find a clean one- or two-seed solution...! dvgrn wrote: I can usually resist this kind of thing, but today I noticed that a kickback reaction into one of Guam's snazzy new 2G-to-G converters produces a fairly clean output glider on the same relative lane, so you get a chain reaction. It is well-known that the R-pentomino takes 1103 generations to stabilise. However, adding a blinker in the right location will approximately triple the period whether it is initially in one phase or the other. Another useless one: how to arrange two pi-heptominoes so that they produce the maximum population of 2310/2314 cells. I think of this one as the "Homer Simpson" reflector. MikeP wrote: I think of this one as the "Homer Simpson" reflector. Four-glider mess takes 22,502 generations to stabilize. I'm not sure if the gliders come from infinity. How might I verify this? DivusIulius wrote: I'm not sure if the gliders come from infinity. How might I verify this? So you'd have add a kickback and turn this into a five-glider construction. I was very surprised to see so many pulsars in the final output, by the way -- until the extra "8" in the rule string caught my eye! My glider-rewinder script might work, too -- as you step backwards there will come a point when the script refuses to rewind one of the gliders. I've been threatening to get back to write a version that rewinds to N ticks but throws up a warning message if some objects can't be rewound. It wouldn't be terribly difficult, but it seems I haven't found the time yet...! dvgrn wrote: I was very surprised to see so many pulsars in the final output, by the way -- until the extra "8" in the rule string caught my eye! 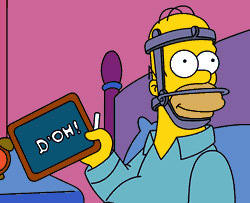 Thanks... D'oh! I too noticed the pulsar anomaly but I didn't realize I was pasting a Pulsar Life pattern! Another useless one: how to arrange two R-pentominoes so that they produce the maximum population of 2818/2814 cells. Edit: It takes 9,496 generations to stabilize. Old and useless... (Almost)-smallest (in terms of bounding box) patterns (after the glider, r-pentomino and their 3 x 3 predecessors), which produce glider(s).